A while back my Mom (G’ma Millie) gave me a bunch of recipes, and since then I’ve had some time to sift through them. I came across this one on type-written paper, which in and of itself was sort of amazing from my Great Aunt Selma. Selma was my grandfather’s sister and known to be a very good cook, Hungarian Czech background. I scanned in recipe so you can see what the original looks like, I have been trying to scan all of my old recipes in so that I don’t lose them. So I figured I’d try out the recipe, because it was different from mine and contained sour cream. How bad can it be? And since there is always the matter of rotting bananas in the house, this is a perfect use for them. I guess what to do with those rotten bananas isn’t exactly a new problem! *a few little notes on this recipe. 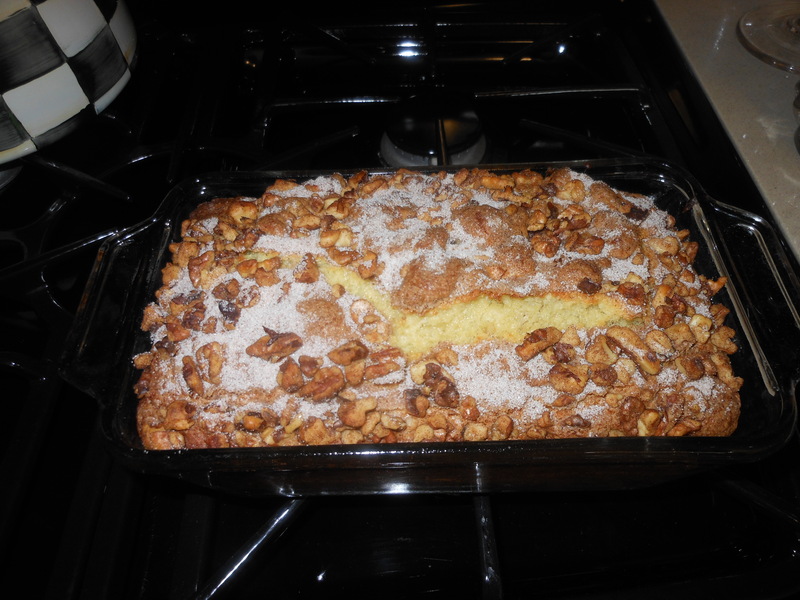 If you are using a loaf pan and you find that in the past your breads are uncooked in the center, and you don’t want to burn entire cake to get the middle cooked, use an 8 x 8 pan and treat it more like a coffee cake! or if you’ve used a glass loaf pan, and you’ve tested center with a long cake tester ( which is a must for loaf type breads) you can try turning heat down 10 degrees and cook for another 10 minutes, or just put in microwave for a quick 1 – 2 minute zap after you remove from oven. If you leave in the oven too long the outside will burn and the inside may still be raw, so this can work. Grease a loaf pan or an 8 x 8 cake pan and sprinkle 1/2 of the topping mixture in bottom of greased pan ( I used loaf pan) spoon in the batter, sprinkle remaining topping on top. Bake in 350 degree oven for about 45 minutes. Check with cake tester, after 40 minutes. Let cake cool at least 10 minutes in pan. I usually just let it sit for as long as possible, till completely cool. I bake in a loaf pan. This is like a banana bread. Use a long cake tester, which is an inexpensive wonderful tool for loaf type breads/cakes. This entry was posted in breads/cakes, Cake, dessert and tagged Banana Bread/ Cake, Great Aunt Selma's Banana Cake, More rotten bananas. Bookmark the permalink. Original Post was April ’12 . 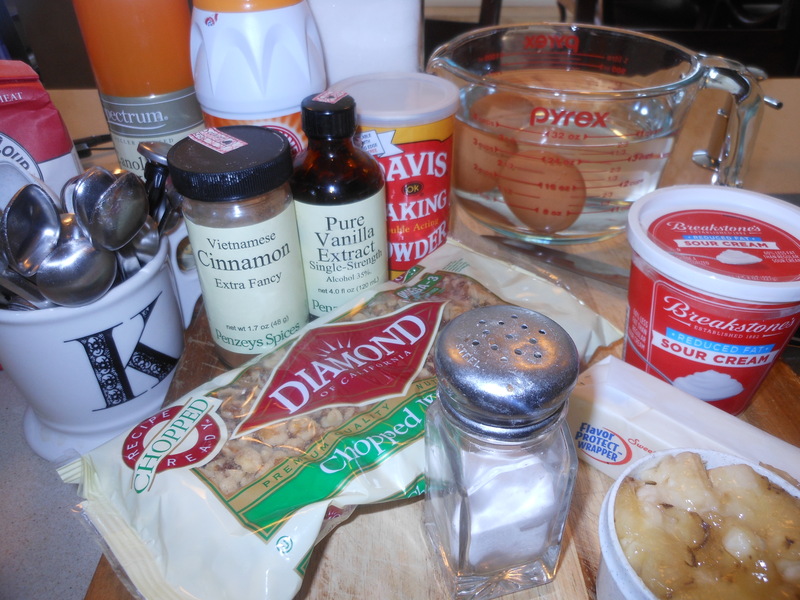 If you missed this recipe here’s your chance to make a delicious rich banana bread. It’s the sour cream that does it. Here is a recipe from my Great Aunt Selma from way back when. Enjoy!